When we tell people, “Yes, chiropractic is for children, too!” the response is often a raised eyebrow. Most have never considered it, but a growing percentage are recognizing the many benefits of pediatric chiropractic care. From birth on, we can help kids address health challenges and prevent future issues from occurring. Dr. Lisa and Dr. 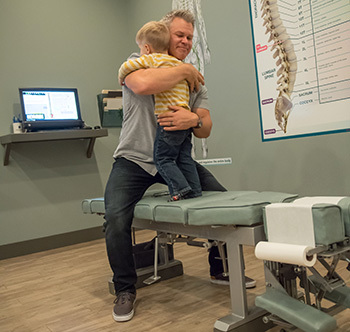 Rob saw the power of Kamloops pediatric chiropractic care with their own children, and have made it a mission to check every baby that’s born in the Kamloops area. The nervous system is responsible for coordinating and controlling everything in the body — including, of course, healing and development, which are essential to children. The spine is commonly a source of interference with nervous system function. We can assist not only childhood illnesses and issues but will ensure that our young patients continue to perform at a high level, growing up healthy and strong. What Types of Conditions Might Chiropractic Care Address? Colic, asthma, acid reflux, migraines, torticollis and other numerous challenges are diagnosed so often in today’s world. If your child’s spine is putting pressure on the nervous system, seeking out a chiropractor for kids may be what they need. Reach out to Inspire Chiropractic & Wellness Studio to get started with pediatric chiropractic care in Kamloops.